The shenanigans began a couple of months ago when my phone started to fill up with messages to phone Jo Brooks. Oh no, I thought. The trouble with Brooks is that she does the press for Banksy, Britain’s most cunning and manipulative street artist. When Brooks leaves messages on your phone you know you are going to be cunningly manipulated. And so it turned out. Before I get round to visiting the weird and wonderful alternative theme park that Banksy has created in Weston-super-Mare — it’s a-mazing, reader, a-mazing — I should probably fill you in on how I became Brooks’s tame art critic. That, reader, is how I ended up in Palestine that Christmas, buying Banksy posters in a pretend gift shop he had opened opposite the church built on the site where Jesus was said to have been born. On the way back to Jerusalem, I could not help but notice that the concrete wall the Israelis had built to separate themselves from the Palestinians was now covered in sarcastic graffiti art that looked familiar. A-mazingly so. Getting back to recent events, nothing popped up on the radar about what Banksy was up to on August 20, until last week. First, I heard from Brooks that on the big day I needed to get myself to “the West Country”. She would not tell me more than that. Then someone who follows me on Twitter began muttering digitally about strange goings-on in Weston-super-Mare. Apparently, a film company had sealed off a ruined lido on the seafront, called the Tropicana, and was building a huge set on the beach with a ruined castle in the centre. Hmmm. Weston-super-Mare? Isn’t that where Jeffrey Archer comes from? On August 19, the phone rang again. “Waldemar, don’t wear sandals or open-toed shoes tomorrow.” “Why not, Jo?” “You know I can’t tell you that, Waldemar. But I promise you it will be a-mazing.” And, indeed, it is. If you have ever wondered how Weston-super-Mare got its comedy name — super what? — it comes from the Latin super mare which means “upon sea”. Hah! Coming out of the railway station, you turn left at the big wheel, past the Premier Inn, past the donkey rides and the Driftwood Cafe, and there is the Tropicana, a crumbling walled enclosure that was once a fashionable slab of seaside art deco, complete with faux Egyptian detailing, across the front of which Banksy has written the word Dismaland. He used to come here as a kid, apparently, in the days when the Tropicana was still a working lido. In its heyday, it boasted the highest diving board in Europe. But since 2000, it has been walled up, another dank British victim of cheap foreign holidays. A few months ago, Banksy, who is from nearby Bristol, happened to walk past and peer through the fence. Since then he has been dreaming of installing a theme park here. And not just any old theme park. But a theme park that hilariously and ruthlessly sends up all the other theme parks, notably Disneyland itself, whose style and appearance Dismaland ridicules at every step. Outside, you are met by glum staff wearing Mickey Mouse ears who answer all your questions with an excessively unhelpful shrug. Which way do I go in? Shrug. Where is the door? Shrug. As you walk away, they mutter “end-joy”. Next up are the security gates, or at least an absurd replica of some security gates, made of cardboard, and staffed by wonky security guards wielding cardboard surveillance equipment. “Stand on one leg,” they instructed me. “Are you carrying any guns, explosives or hand grenades?” “No hand grenades,” I replied. 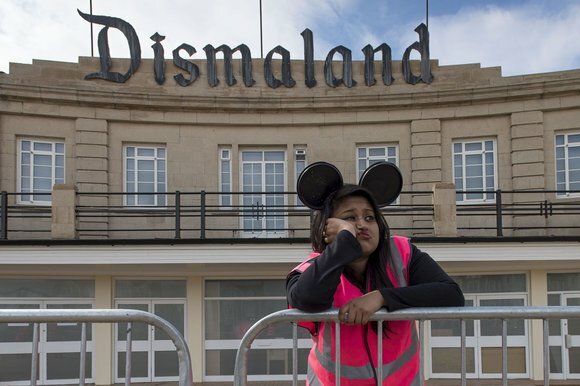 Disney’s lawyers have been banned from entering Dismaland. Were they to penetrate the cordon of deliberately moronic staff sporting Mickey ears they would find an experience that mimics and subverts everything that Disney stands for. Did you ever see that brilliant 1960s TV series, The Prisoner, starring Patrick McGoohan, who wakes up one morning in an unreal world where the normal rules no longer apply? It is a bit like that. At the Punch and Judy show, Punch has turned into a Jimmy Savile lookalike who beats and rebeats his wife in a script written by Julie Burchill. At the coconut shy, there is a game called Knock the Anvil where you try to knock an anvil off a pedestal by throwing a table tennis ball at it. The first prize is an anvil. Dispersed among the warped fairground rides of Banksy’s “Bemusement Park” are various pointed artworks, not just by him but by a selection of artists. The unwinnable anvil game has been devised by the Turner prize nominee David Shrigley. Inside the main exhibition tent, there are two large sculptures by Damien Hirst. If you are curious why you cannot wear sandals it is because all this is set in a rubbish-strewn expanse of gravel that seems at every turd-strewn step to evoke the crumbling grottiness of roadworks Britain. See the black pond with the motorised dinghies packed with illegal immigrants? That is another Banksy sculpture. See the fire pit near the exit? That is where they burn a selection of Jeffrey Archer’s books every night. It all adds up to an experience that keeps pummelling you with surprises. To pick the most ambitious example, the ruined castle at the centre of the ruined lido, the one whose moat is filled with unwanted supermarket trolleys and dog poo, turns out to house a spectacular reimagining by Banksy of the Cinderella story. The first thing you see when you walk in is a battered old television set on which the Disney film is about to come to an end. Cinderella has been to the ball. She has met her prince. He has tracked her down with the glass slipper. They are about to live happily ever after. But wait. What is that light flashing on and off in the darkness beyond? Oh no. There has been a terrible accident. Cinderella’s coach has crashed, and some life-sized police have turned up to investigate. There is a body hanging out of the door. It is Cinderella. And is it just me, or does she not suddenly look a bit like Lady Di? So that is how it all works. Using the language and methods popularised in theme parks, Banksy has built a full-scale alternative to Disneyland in which every ride, game and exhibit sets out to question not just the purpose of theme parks but also the crumbling, grotty state of modern Britain. The Tropicana must have been a-mazing in its pomp. But it is even more a-mazing in its decay. It will be open for the next five weeks, and for the £3 entrance fee you and your kids will be treated to the most entertaining submersion in “entry-level anarchism” that theme park Britain has seen.